Troubled Vietnam vet John Eastland (Ginty) returns in this Cannon-made sequel. For those that don’t know, Eastland has been dubbed by the media as “The Exterminator” because he goes around the streets of New York City with a flamethrower, taking the law into his own hands and roasting street punks into a pile of ash. His friend Be Gee (Faison) drives a garbage truck for Knight Waste Removal and offers John a job. Plus he and his dancer girlfriend Caroline have a budding romance. It seems all is looking up for the Termina...er...I mean EXTERMINATOR, but there’s a problem: the charismatic leader of a criminal underworld named simply X (Van Peebles). This guy has messiah-like delusions and is a ruthless commander of seemingly every punk in the city. X doesn’t take kindly to Eastland barbecuing his compatriots, so all-out war is declared. Eastland is putting a serious dent in X’s ambitions to control the city entirely, a lot of which is dependent on his drug dealing involving the local Mafia. When Caroline is assaulted by X’s gang, shattering her dreams of dancing on Broadway, John and Be Gee soup up the garbage truck Gauntlet (1977)-style and go for the ultimate revenge yet: X himself. Exterminator 2 is the only directorial credit for Mark Buntzman, and there is a certain lack of confidence behind the camera that that would imply. Plus different countries have different cuts, many have the more violent scenes trimmed. It is said the Greek VHS is the most intact to date. But despite some of its technical flaws, the movie has great 80’s atmosphere and music that cannot be duplicated today. X and his gang wear some of the best outfits since Knights of the City (1985). Interestingly, there are some great breakdancing scenes in the movie too, which bring up the level of interest for the viewer. Faison as Be Gee is lovable and sympathetic, especially for this down-and-dirty type of exploitation film. The name of his truck, “Knight Waste Removal” is a not-too-subtle representation of the movie itself: He and/or Ginty is the “Knight” in shining armor (or some kind of armor) that will save the day, and “Waste Removal” clearly implies X’s gang of no-good-niks. They even put one in the trash compactor, and at one point while they are cruising around in the truck, and they spy some baddies, Be Gee says “looks like there’s some trash right there”. Ginty is as taciturn as ever but that’s why we love him. 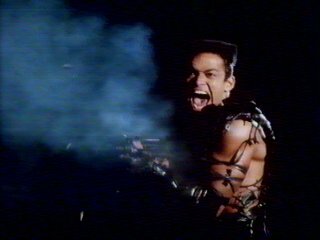 Plus his alter-ego “The Exterminator” is just too awesome for words. You want to stand up and cheer every time he appears on screen with his metal mask, brandishing his flames of death. Playing a complementary opposite to Ginty’s phlegmatic nature is the bombastic, over-the-top Van Peebles as X. His big line, which he says more than once, is “I am the streets!” He makes a great bad guy because of his energetic performance. 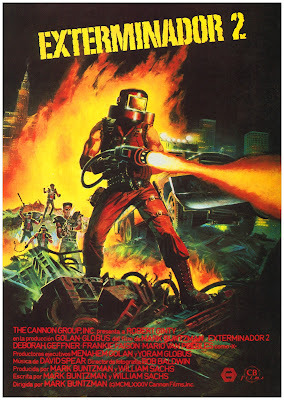 Pretty gritty, fans of revenge movies or 80’s nostalgia will like Exterminator 2, and if you are a big fan of both, like me, any flaws the film may have are glossed over nicely. NOTE: It was released on VHS in the U.S. on one of those silver MGM-Cannon big boxes, with a stated running time of 88 minutes. Presumably due to the aforementioned cuts, it just barely reaches that time even after the slow-moving end credits. I really need to watch the Exterminator movies again soon. I thought they were awesome when I was a kid, but haven't seen them since the late '80s/early '90s. Bugger me!! This is a very serious trip down memory lane!! It was super violent in its day and had a R-18 rating when released in NZ. By god that seems like a milion years ago now!! As soon as I saw that cover! man the memories spilt out. It was heavily cut here as well and I would actually like to see the un-cut version and see how it has dated compared to the violent movies of today. Life Between Frames: Cool! Would be interested in your opinion. They still hold up! Brent: It would be great to finally see an uncut version! We're happy to see this movie brought out good memories for you. A friend of mine watched this and told me that if I liked Hobo with a Shotgun (which i did) then I was going to love this. I'm excited. It is a fun movie! Still have to watch Hobo With A Shotgun. Rutger Hauer is the best. Hopefully one day we will get an uncut version of the sequel. Also: thanks for the cool links, Lee! Totally off topic. I searched your blog for Laser Mission and nothing came up. And I thought "WHAT?" Definitely an oversight on our part. We will try to get a copy and review it soon. Brandon Lee and Ernest Borgnine should be at their best in it.